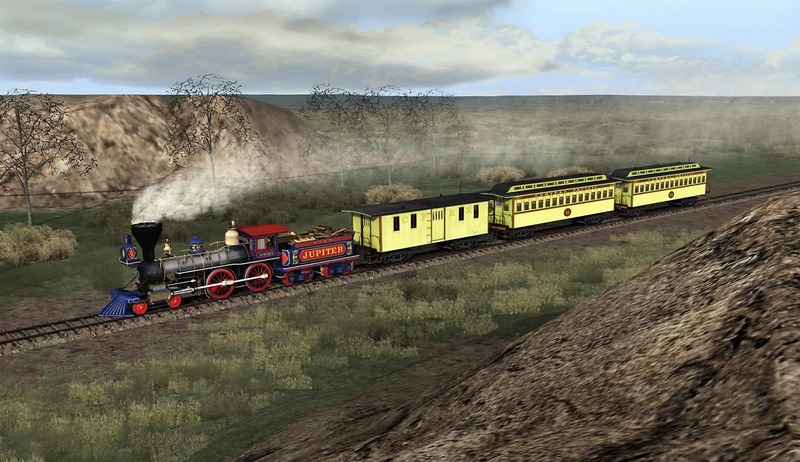 Smokebox brings all the enthralling experiences of “Old West” American railroading to Train Simulator! 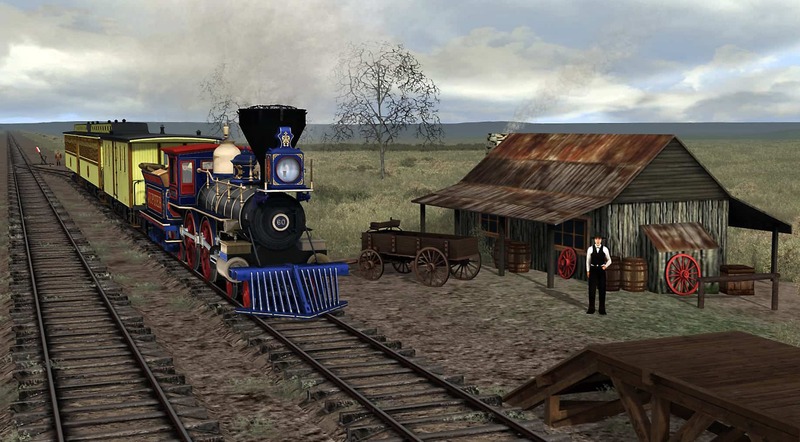 You can experience the unique, challenging, and utterly enthralling experiences of railroading in America’s “Old West” with Train Simulator and the remarkable 1860s add-on collection of renowned developer Smokebox! If ever there was a “Train Simulator time machine,” the Smokebox 1869 Cheyenne route (which accompanies Smokebox’s Union Pacific No. 119 add-on) is it! Centered in frontier-era Cheyenne, Wyoming, the route brings to full and vivid life the rough-and-tumble time when the Union Pacific and Central Pacific were setting down rails across the West. destined to meet at Promontory, Utah on May 10, 1869. At Cheyenne, the Smokebox 1869 route includes a rail yard, enginehouse and turntable, engine servicing facilities, freight houses, passenger depot, stock pens, and old Cheyenne itself (including a saloon!). From Cheyenne, the formative-era Union Pacific main line extends both east and west (some 26 miles in total) and includes water and fueling stations, stage coach stops, and authentic, functional “ball” signals. Also extending from Cheyenne is a branch line to Camp Carlin, a U. S. Army depot rich in both frontier appeal and switching opportunities! Smokebox’s Cheyenne 1869 route accompanies Union Pacific No. 119, one of the historic participants in the Golden Spike ceremony. Union Pacific No. 119 was a 4-4-0 “American” type built by the Rogers Locomotive and Machine Works in the company’s Patterson (New Jersey) shops in November 1868. With 57-inch drivers and 16” x 24” cylinders, UP No. 119 was one of a group of five sister 4-4-0s acquired by UP at the time. Following its historic moment at Promontory, UP No. 119 went on to serve the railroad until it was retired and scrapped in 1903. As masterfully crafted by Smokebox, UP No. 119 (and accompanying sister No. 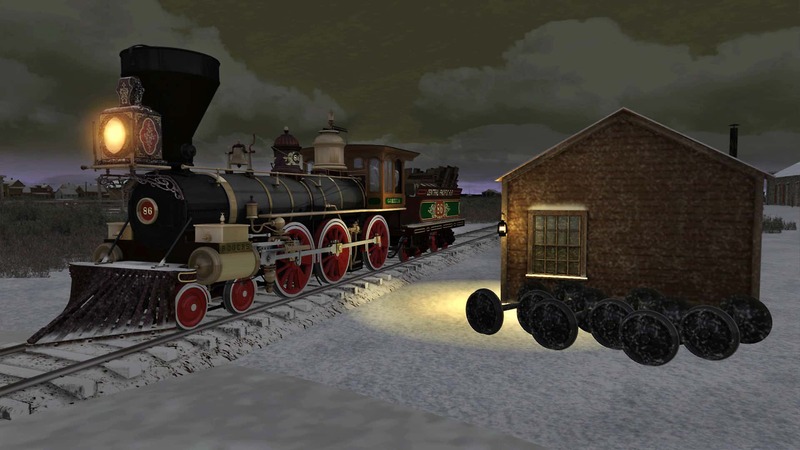 116) is an extraordinary re-creation of the original and this add-on also includes period-authentic Union Pacific passenger and freight equipment and a selection of career scenarios on the 1869 Cheyenne route! At the driving of the Golden Spike on May 10, 1869, it was Central Pacific’s 4-4-0 “Jupiter” that stood pilot to pilot with Union Pacific No. 119. Built in the summer of 1868 by the Schenectady Locomotive, No. 60 was one of a quartet of identical 4-4-0 locomotives built for the CPRR. The “Jupiter” was designed for dual service, with 60-inch-diameter drivers and 16 x 24-inch cylinders and a total engine weight of 65,400 pounds and was typical of its era in that many of its operating features were relatively primitive (including a lack of air brakes!). 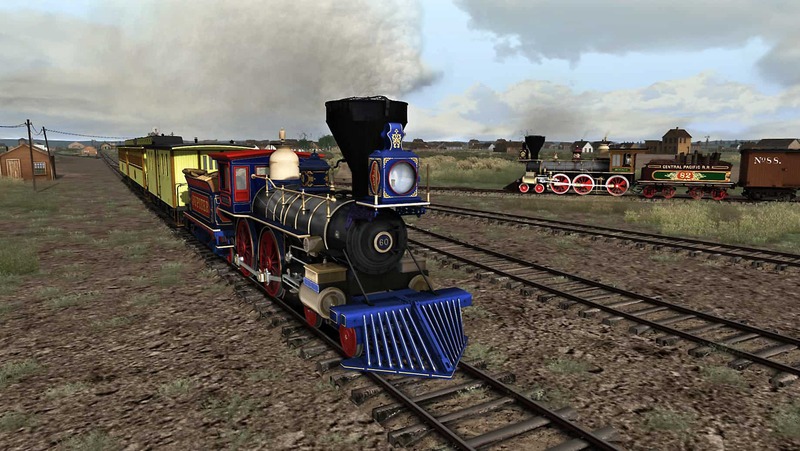 The “Jupiter” add-on includes the historic 4-4-0, its sisters, and a selection of CPRR passenger and freight equipment. 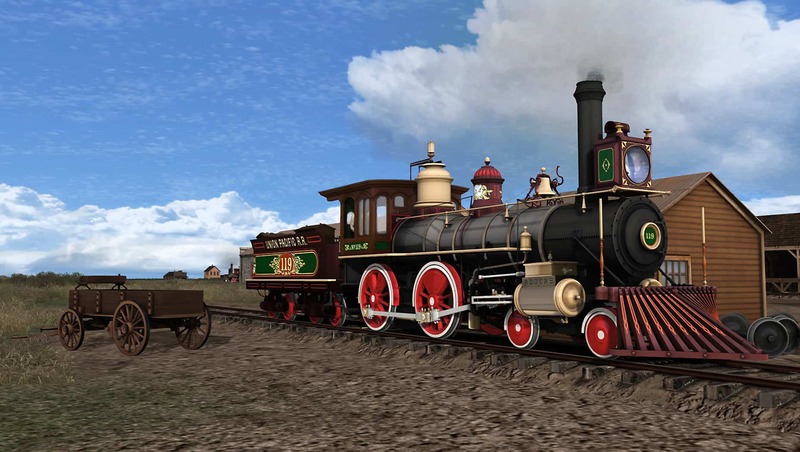 The latest addition to Smokebox’s “Old West” collection is Central Pacific’s husky “Buffalo” Ten-Wheeler. Constructed at Paterson, New Jersey by the Rogers Locomotive & Machine Works in 1868, Central Pacific’s “Buffalo” class included five steam locomotives. Based on Rogers standard 4-4-0 design (of which one example was historic Union Pacific No. 119), the locomotives of CPRR’s Buffalo-class were (as compared to the omnipresent 4-4-0s of that era) equipped with an extra set of driving wheels, making them 4-6-0 Ten-Wheelers. 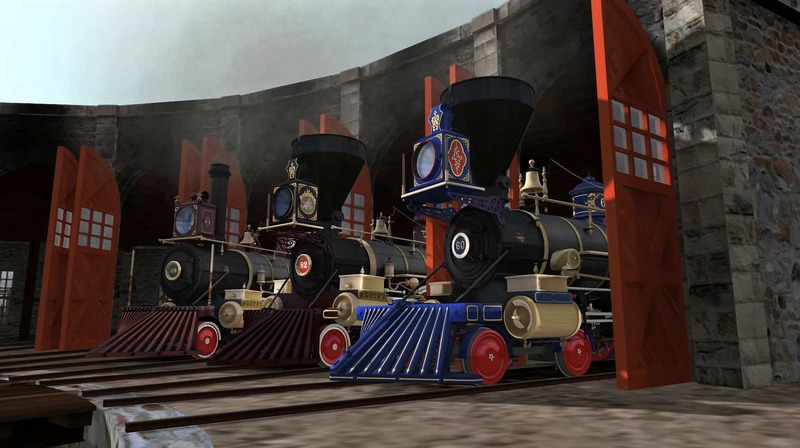 As with all its locomotive masterpieces, Smokebox has re-created the CPRR Ten-Wheeler (provided as both the “Buffalo” and sister locomotive the “Gorilla”) with an absolute fidelity to detail and authentic operating characteristics. 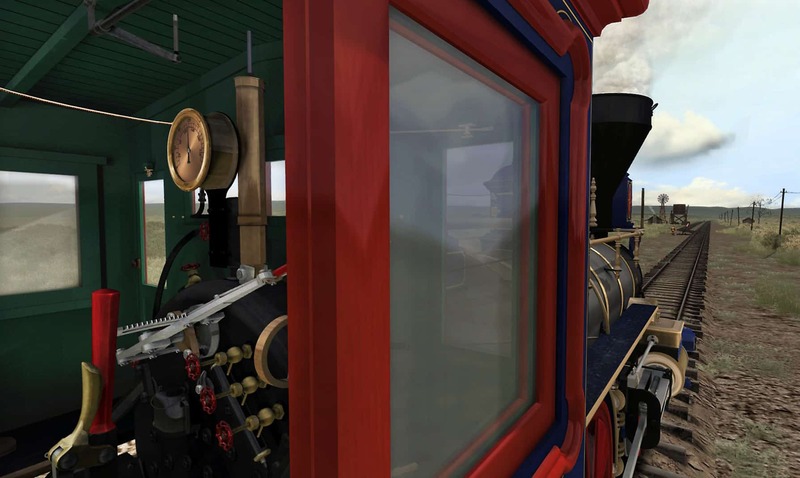 The 4-6-0 will provide a variety of operating challenges to the engineer, including stoking a wood-burning fire, managing injectors and boiler steam pressure, handling realistic throttle lag, and dealing with genuine wheel slip. With numerous interactive and animated elements, the Ten-Wheeler is remarkable in realism. Smokebox provides expert and simple operating modes that make the locomotive fully accessible and enjoyable for users of all experience levels. 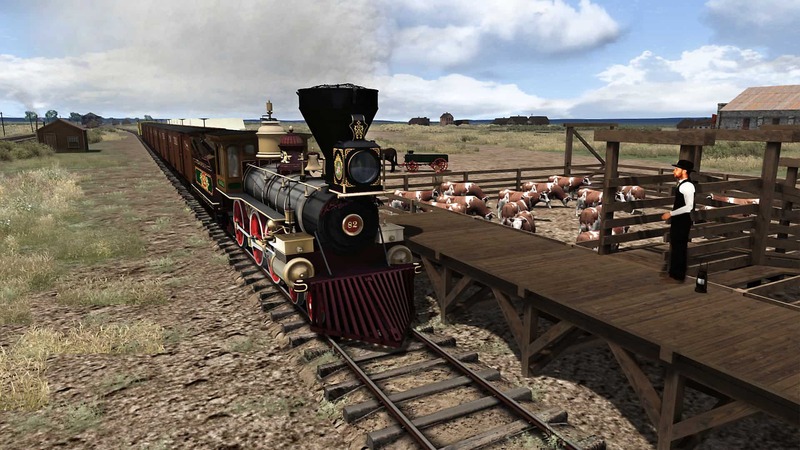 The “Buffalo” and “Gorilla” are also accompanied by CPRR freight and passenger stock and scenarios for the 1869 Cheyenne route! 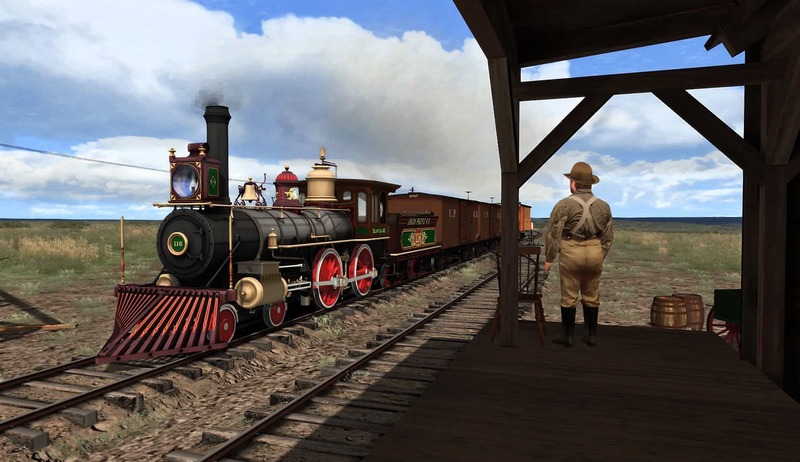 You can experience the unique, challenging, and utterly enthralling experiences of railroading in America’s “Old West” with Train Simulator and the remarkable 1860s DLC collection of renowned developer Smokebox! On Smokebox’s Cheyenne 1869 route, Union Pacific 4-4-0 No. 116 (a sister of historic UP 119) arrives at the U. S. Army’s frontier Camp Carlin. Screenshots by Gary Dolzall. Built by Rogers Locomotive & Machine Works, Union Pacific No. 119 was one of five sisters (UP road numbers 116-120) constructed in 1868, and the 119 was destined for fame when it stood pilot-to-pilot with Central Pacific No. 60, the “Jupiter,” during the transcontinental railroad’s Golden Spike ceremony at Promontory, Utah on May 10, 1869. 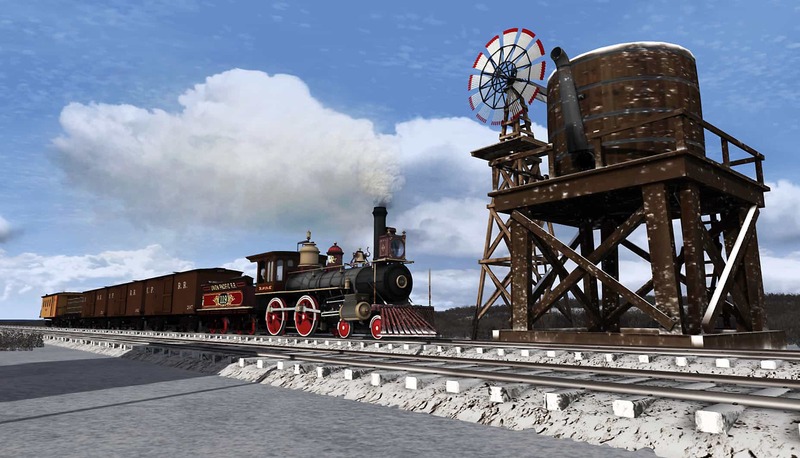 The Smokebox UP 4-4-0 DLC includes the remarkable 1869 Cheyenne route. Union Pacific No. 119 is dusted in snow as it chugs into a stage stop and fueling station west of Cheyenne on Smokebox’s 1869 Cheyenne route. Union Pacific 119 is provided in green and red livery variations and accompanied by period-authentic UP freight and passenger rolling stock. At the driving of the Golden Spike on May 10, 1869, it was Central Pacific’s 4-4-0 “Jupiter” that stood pilot to pilot with Union Pacific No. 119. Built in the summer of 1868 by the Schenectady Locomotive, No. 60 was one of a quartet of identical 4-4-0 locomotives built for the CPRR. Historic CPRR No. 60 is hurrying east across the Wyoming plains (above), then pulls into a stage stop east of Cheyenne (below). 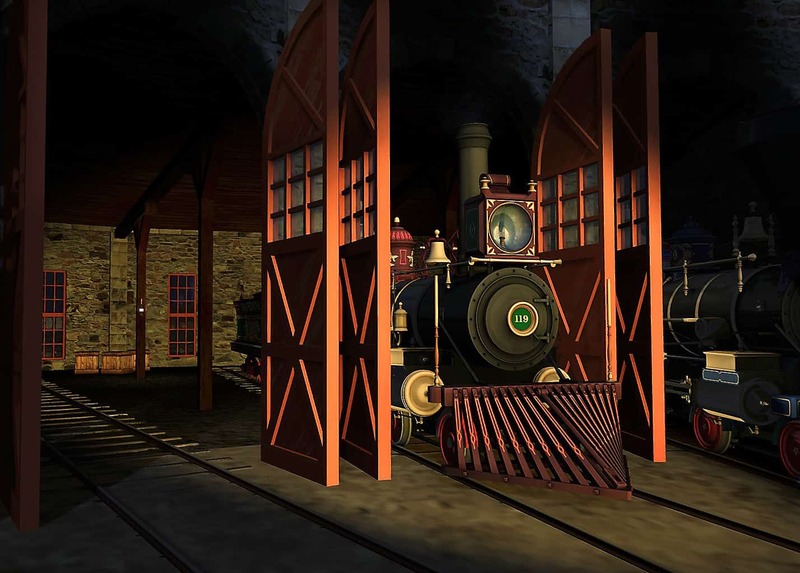 Smokebox and Mike Rennie are renowned for creating Train Simulator locomotives with absolute fidelity to detail and authentic operating characteristics, and whether you climb aboard the cab of CPRR No. 60, UP No. 119, or the newly released CPRR Ten-Wheeler “Buffalo,” you’ll enjoy true-to-life 1860s railroading challenges and experiences. At Cheyenne on the extraordinary Smokebox 1869 route, historic Central Pacific 4-4-0 No. 60, the “Jupiter,” has eastbound passengers in tow as husky CPRR Ten-Wheeler No. 82, the “Buffalo,” prepares to depart with westbound freight. The latest addition to Smokebox’s “Old West” collection is Central Pacific’s husky “Buffalo” Ten-Wheeler. Constructed at Paterson, New Jersey by the Rogers Locomotive & Machine Works in 1868, the locomotive was based on Rogers standard 4-4-0 design (of which one example was historic Union Pacific No. 119) but was equipped with an extra set of driving wheels, making it a 4-6-0 Ten-Wheeler. CPRR No. 82, the “Buffalo” is at work with tonnage in frontier-era Cheyenne (above and below). 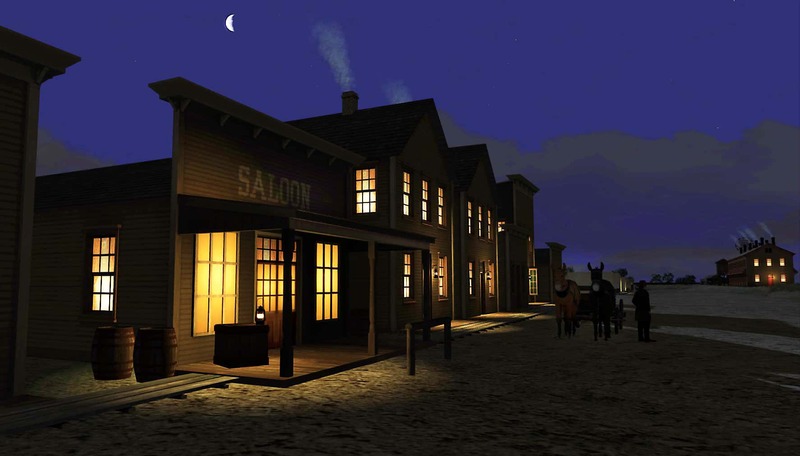 On a snowy 1869 night in “Old West” Cheyenne, a sister of the “Buffalo” -- CPRR No. 86, the “Gorilla” -- rests near the engine house. The “Buffalo” class included five locomotives. 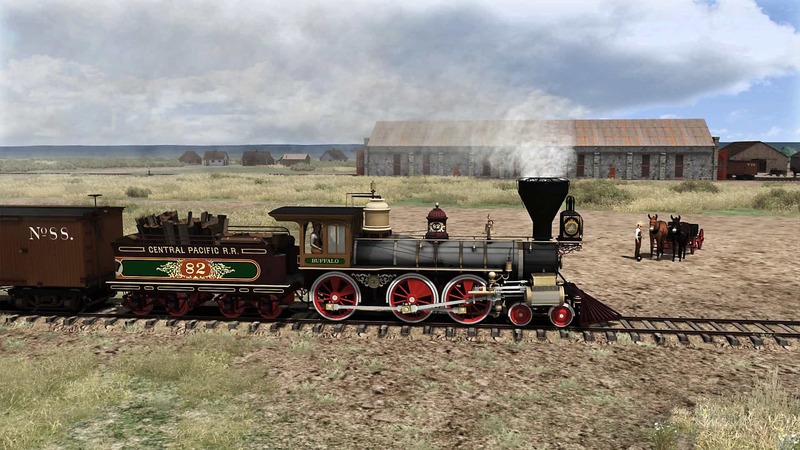 Smokebox’s “Buffalo” DLC includes a selection of CPRR rolling stock and scenarios on the 1869 Cheyenne route. 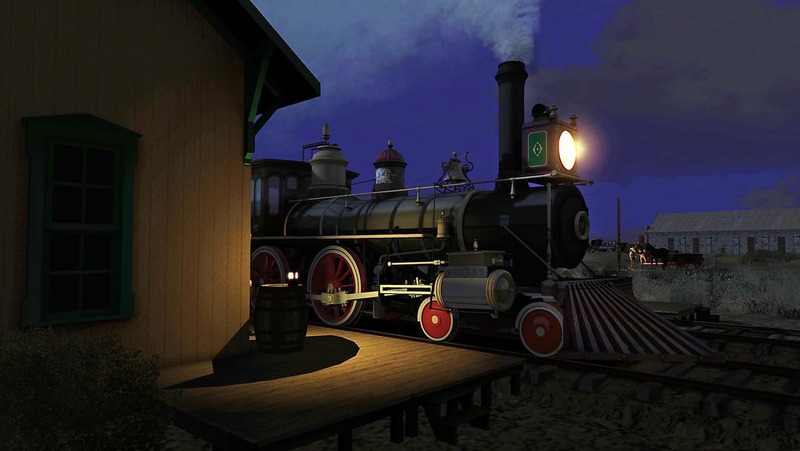 The unique and captivating railroading of America’s “Old West” – with wood- and coal-burning steam locomotives, frontier towns, and daunting operations – awaits you with Smokebox’s superb 1860s Train Simulator DLC collection, all available at the Steam and Dovetail Games Stores!